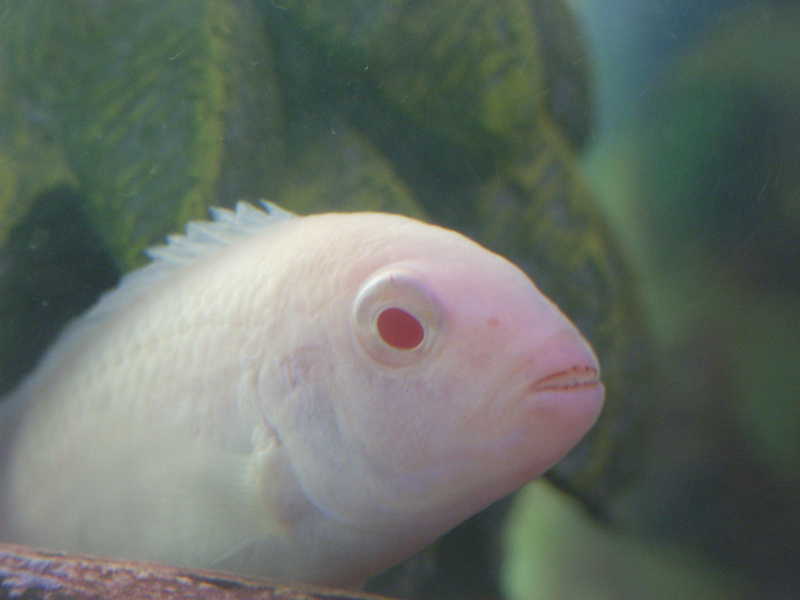 My white/albino cichlids have multiplied – The journey! My experience with these white/albino mouth brooders were very interesting. About 2 and a half months ago I noticed one of my white cichlids having a sack underneeth its mouth and as usual I thought it was the food it saved for later, as they love eating :). the next day before I added the food into my Cichlid tank, I noticed the sack was still there on 2 of my white Cichlids. I monitored the 2 for about a week, and every day I could see the sack getting bigger which i then knew was a sure sign of eggs or ever small litters. I started observing the 2 very closely and decided to get a small tank to isolate the ones with the sacks, I also knew that changing a Cichlid into a new tank can cause stress to the fish, so I tried to replicate the small tank as much as possible to the mother tank. I left the tank running for about a week with the mother tanks water and decided to put 1 one the fish into the small tank. After about 2 hours of trying to catch the fish without stressing the fellow i finally got a hold of it and transferred it over to the small tank, which i call my maternity tank :). After the second day I see the fellow in the small tank releasing the its fry from the mouth, wow it was such a lovely sight :), i cannot expressi it. I knew i had to seperate the small from the Big immediately, so I caught the Big one and put it back to the mother tank. The fellow was very happy to be back with the others in the tank. Posted in Cichlid and tagged albino, breeding, cichlids, fry., litters, white.